Hey again sweaties! Hope you’re all finding time to stay fit now that school is in full swing! 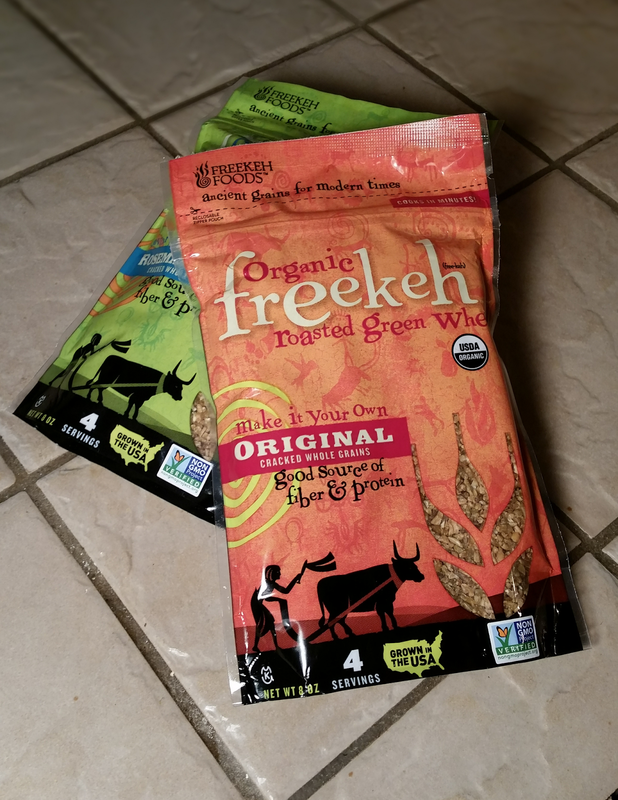 Today I’m comin-atcha with a review for Freekeh! ….um wha?! That’s right you read that correctly, Freekeh (Free-Kah) and no I’m not asking you to get-yo-freak-on. Freekeh is actually wheat that has been harvested while still green and then roasted. It’s been touted as the “new” superfood but it’s actually pretty old. So old, its ancient! History shows that it’s been eaten in countries like Egypt, Syria, and Lebanon for many centuries. What’s most interesting (and what grabbed my attention) about Freekeh is it’s high nutritional value. It’s is very high in protein, vitamins, minerals, and fiber. It’s even lower in glycemic index when compared to other grains. Why is that so important you ask? Well, fiber is essential in reducing cholesterol in the blood and promoting heart health. It also slows down digestion time to keep us feeling full longer. The glycemic index refers to the effect a particular food has on the blood sugar levels. Lower GI diets have been associated with decreased risk of many diseases such as type 2 diabetes, stroke, chronic kidney disease, cancers of the breast, colon, prostate, and pancreas (just to name a few). As soon as I heard about Freekeh I jumped at the chance to try this “new” ancient grain. I received two packages of Freekeh to try out one original flavor and one in Rosemary. 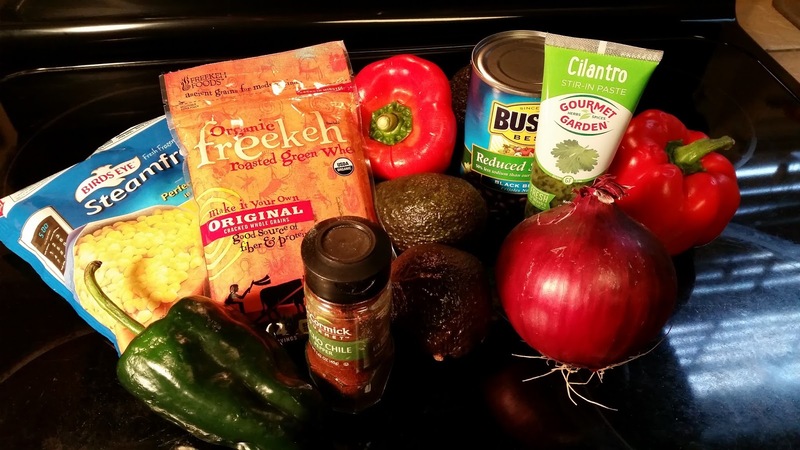 We cooked our original flavored Freekeh and decided to make a nice burrito bowl with it. Before mixing I wanted have a bite of plain unflavored Freekeh to see what it was like. The texture was chewy, a lot like bulgur or a slightly uncooked rice. We followed the preparation directions on the back of the bag however, in hindsight I would cook the original flavor in a broth. Perhaps low sodium chicken or beef broth to give it a subtle flavor. We mixed our original Freekeh with grilled corn, red bell peppers, ancho chilli, avocado, purple onion, black beans, and cilantro paste. It was delicious! I also found that it didn’t have that bloated full feeling after my meal like you may find when eating plain rice. What I love most about this food is the plethora of health benefits. I mean, I just can’t say enough good things about it! After researching more from the whole grains council and eatrightpro I’m 100% certain that this a food I will be rotating in my daily grains. It’s right up there in my favorites with quinoa, buckwheat, and whole wheat rice. The high fiber and protein are going to help with lasting feelings of satiety (the feeling of fullness) which means you feel full longer and you eat less often. Not to mention all the awesome benefits of high fiber. That alone had me sold! Freekeh has almost three times the amount of fiber has brown rice. 3 times! High fiber diets have been linked to lower body weight, prevention of constipation and so much more. 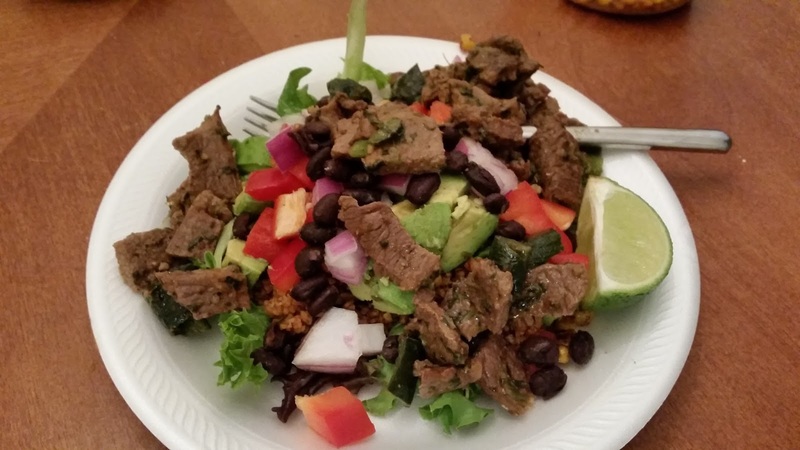 In this day and age of processed low fiber foods, we could all use a little more. Feekeh Foods has agreed to giveaway one package of Freekeh to one of my readers! You can choose the flavor: original, rosemary sage, or tamari. Giveaway open to U.S. residents only. To enter you must follow @freekehfoods on Twitter and Instagram, like them on Facebook, and tweet about the giveaway using the hashtags #LoveFreekeh #Freekeh. Just use the rafflecopter below and be sure to leave me a comment with the flavor of your choosing! Giveaway ends 09/16 and the winner will be announced 09/17. i think the original sounds great! I would most like the original.